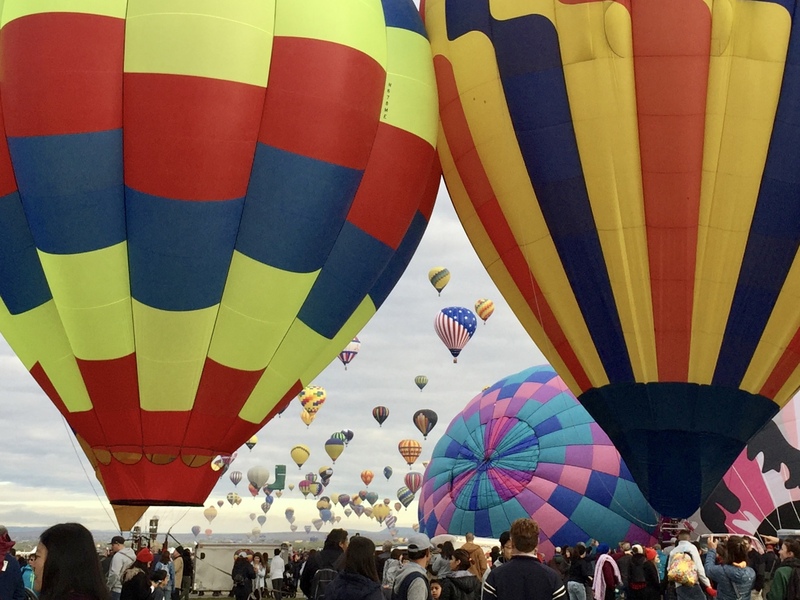 Every October balloon enthusiasts from around the world converge in Albuquerque, NM. 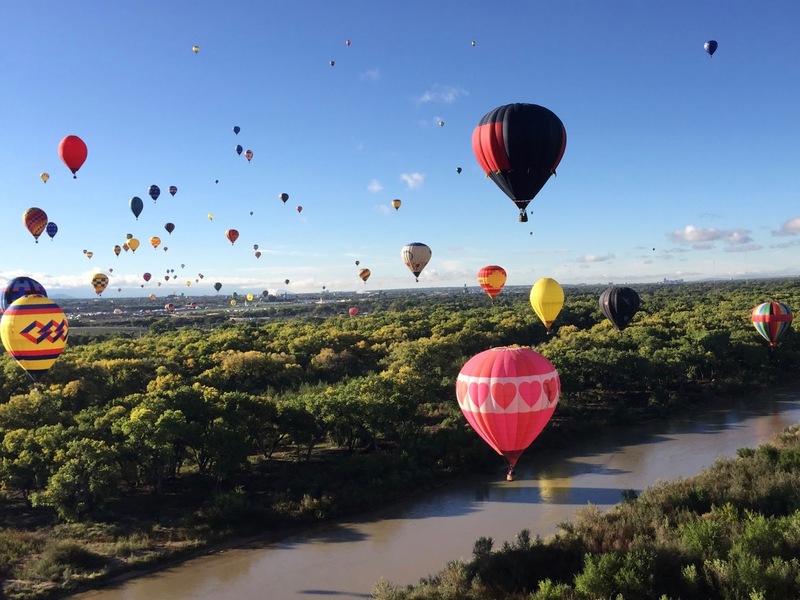 This year 600+ balloons from 16 different countries were in attendance. Spectators in the thousands, traffic backed up for miles every morning beginning at 4:30am. Fortunately for us, we were in an RV parking area, only 1/2 mile walk to the launch field. The RV parking area had over 1,000 sites, lots of people walking, plus bus and golf cart shuttles. We usually walked, although some mornings we lucked out...a nice golf cart driver would pull up to us and ask if we wanted a lift. At 5:30 in the morning, dark and chilly out, and rushing to the field, we eagerly jumped in. Those devoted shuttle drivers (volunteers) start at 4am in the morning. The festival was very well organized and supported by many many volunteers. 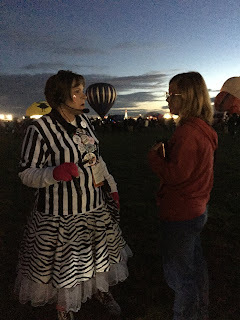 As part of a balloon crew, we too were volunteers. Volunteers receive a weekly pass into the event. It's such an exciting place to be. 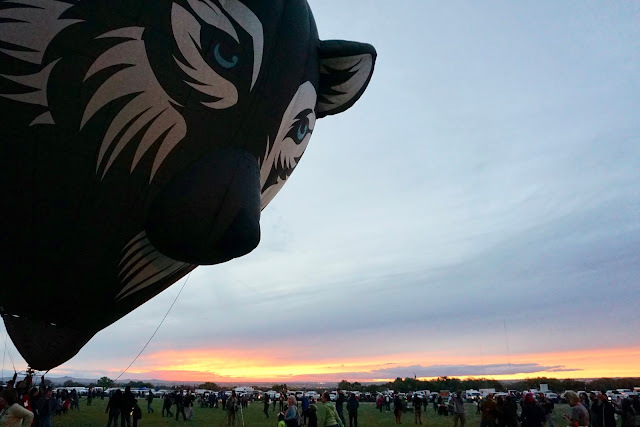 We were at the launch field every morning by 6:00am. 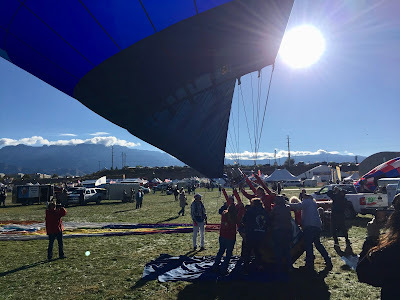 Pilot briefing was at 6:15, sometimes we went to the briefing, other times got a cup of Pinon coffee and went to our chase vehicle loaded with balloon and gear. Dawn Patrol launched about 6:30; a small number of selected balloons launch before sunrise, it's a beautiful sight when they glow. Dawn patrol is a scouting flight of sorts, it helps watchful pilots determine wind aloft conditions and plan for their flight. Vincent Van Gogh from the Netherlands was one of my favorite balloons. 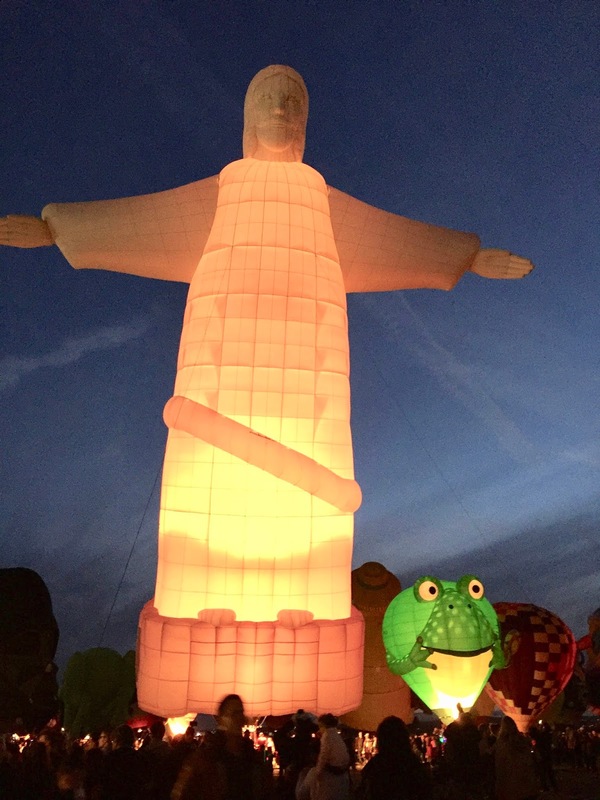 This evening was too windy to fly or inflate. With so many people being at the field, the pilots set up their baskets and fire up their burners. At least the people get to see something and talk to the pilots. The pilots all have balloon cards much the same as football cards, the kids are so excited about the balloons and have a good time collecting cards. Handing out cards was another of our crew duties. Airabelle. Another favorite. She's ginormous! The basket is under her belly, can't see it in this photo. All the balloons have creative names, this old gal is Airabelle, the CreamLand Cow, she's from British Columbia. 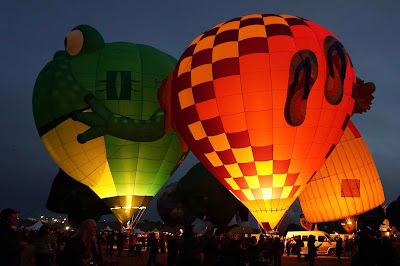 Balloons of this sort are in a category appropriately called Special Shapes. 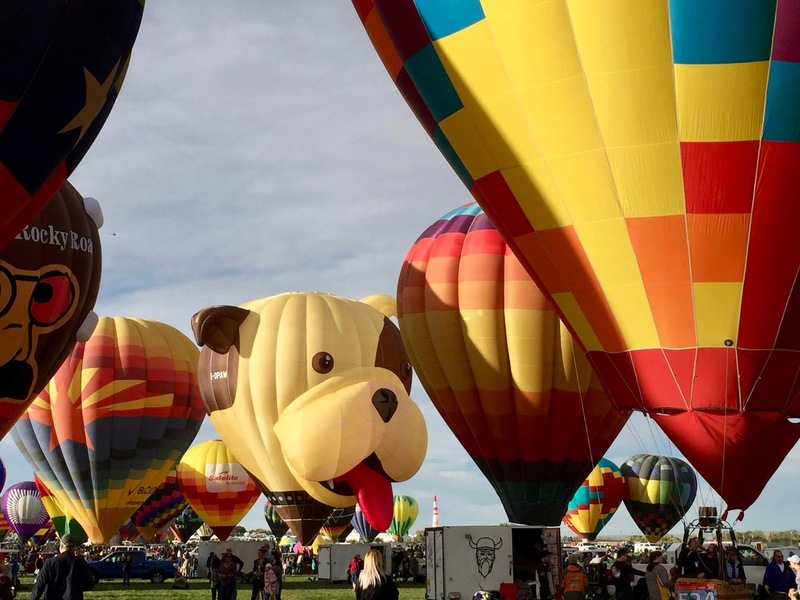 Although all air worthy, we only saw Airabelle fly one day, usually she was inflated and tethered. After working on our balloon with our crew of 5, I can't imagine having to pack up and lug her around. 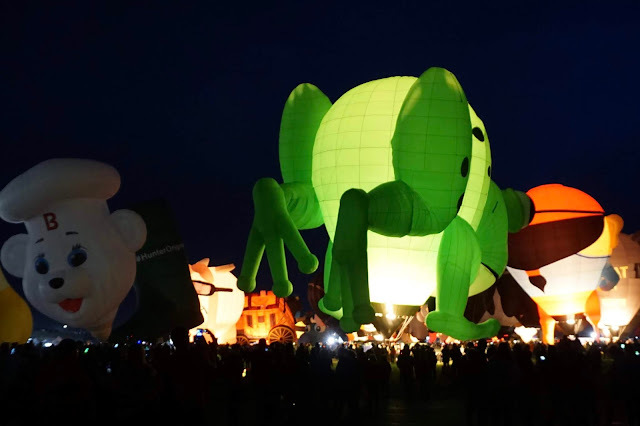 Some of the special shapes balloons have a crew of 25 or more. 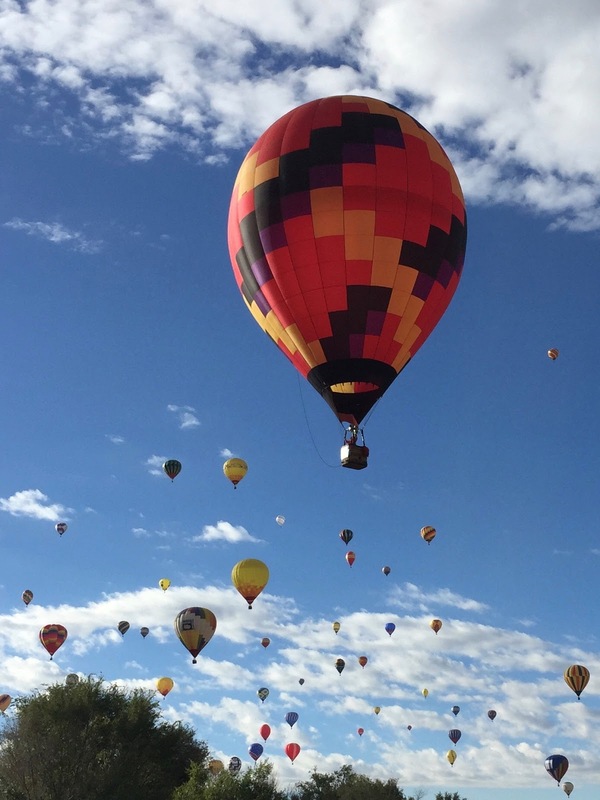 I also noticed the larger balloons used wheeled carts, where as our balloon was moved by crew power. Our pilot did have a lift tailgate on the back of her truck, was nice. Our pilot brought 2 balloons. 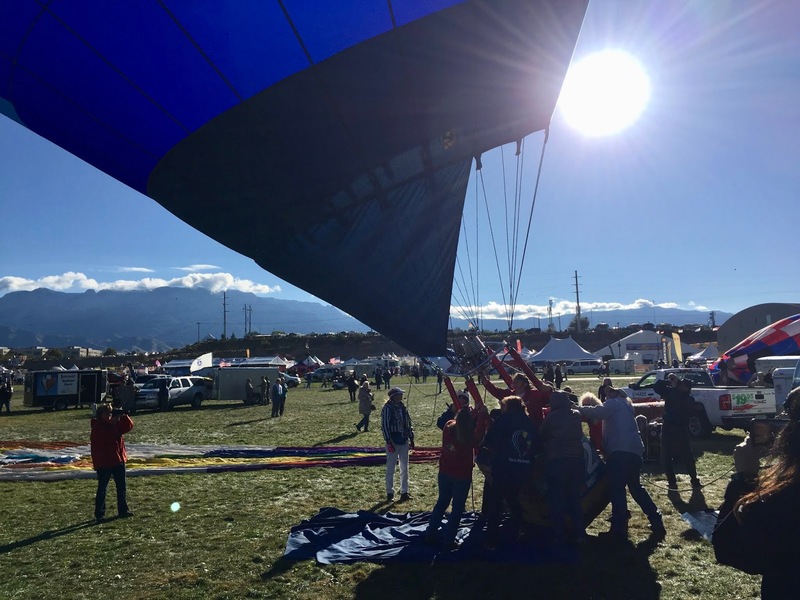 Here we're laying out the balloon, "MyAir FlyAir" getting ready to inflate. 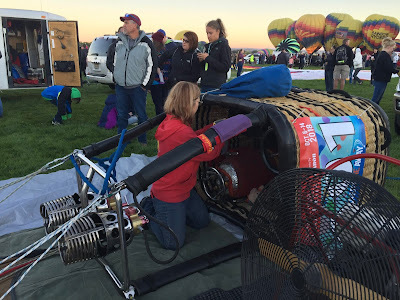 She also had a little smaller balloon, a racer, that she used in competition flying, it was easier to inflate and pack up. We liked it better. 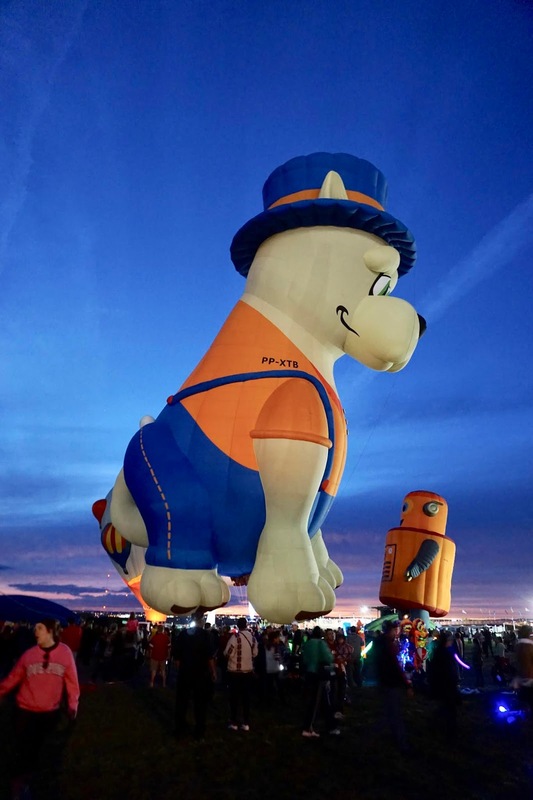 Our pilot Myia checking things over before the inflating. Our pilot's balloon, Rik Rak, a racer balloon, the envelope size being 65,000 cubic feet, or 65,000 basketballs would fit in the envelope (balloon). 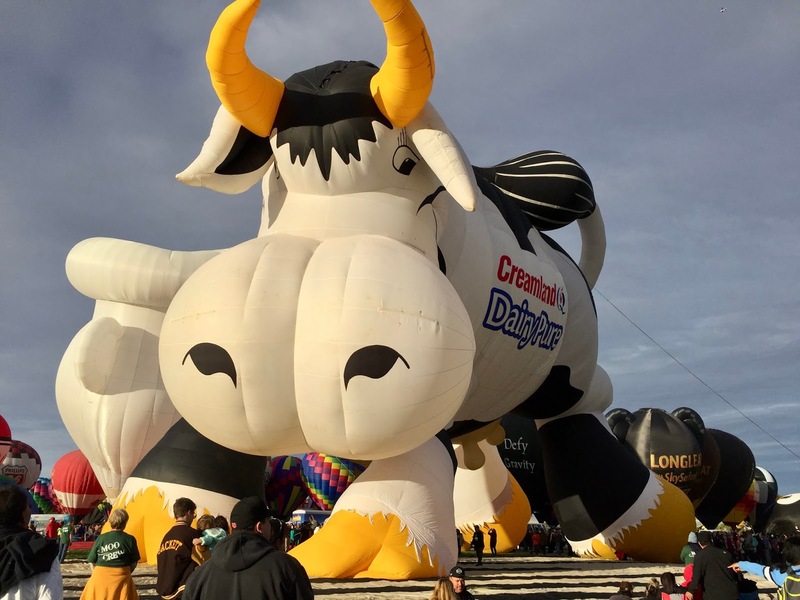 It's a little smaller than her other balloon and more maneuverable, she uses Rik Rak for competetion flying. It's also the balloon Tom and I got to fly in. The highlight of our week was getting to fly, it was unexpected, just before lift off pilot Myia shouted "jump in now! "...no time for second thoughts, I jumped in. Tom got to fly the next day. My flight with Myia took us over the Rio Grande River...never knew the Rio Grande went through Albuquerque. Our flight lasted over an hour, it went by all too fast. IT WAS TOTALLY AMAZING, JUST FLOATING, SO QUIET AWAY FROM THE NOISE AND TRAFFIC BELOW. Tom got to fly the next day. We've been bragging about our flights ever since, ha ha. 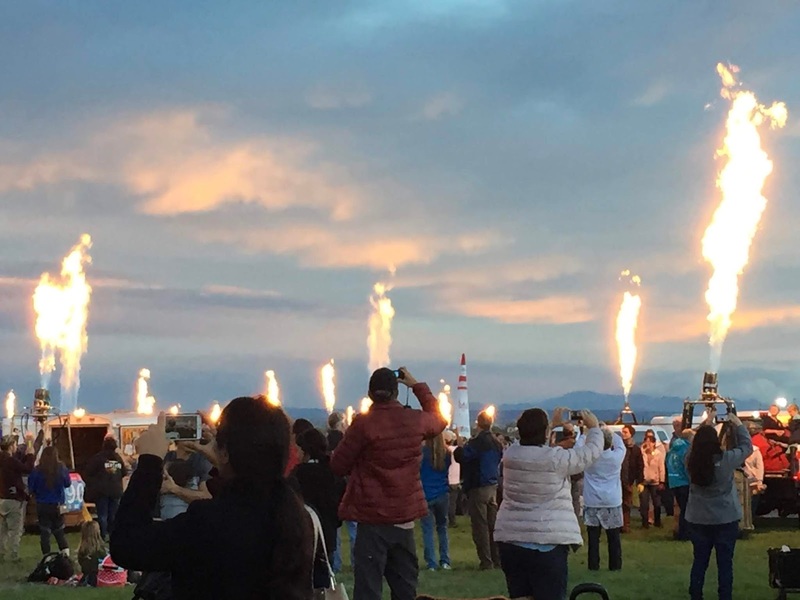 Pilots have fun dipping down and touching the water, known as a "splash and dash", sometimes getting their feet wet inside the basket, the balloon Hearts of Fire is getting ready to Splash. Too windy. Once the meteorologist fly the green flag, pilots have the ok to fly, however, it's still up to pilot's discretion. This day was iffy, already a delayed start, the green flag finally went up. Our pilot decided not to fly or even unpack, I think a good choice. This pilot started to set up, the wind was whipping the envelope around, others join in holding down the basket. After this wind gust, the pilot decided not to fly. Night Glow. 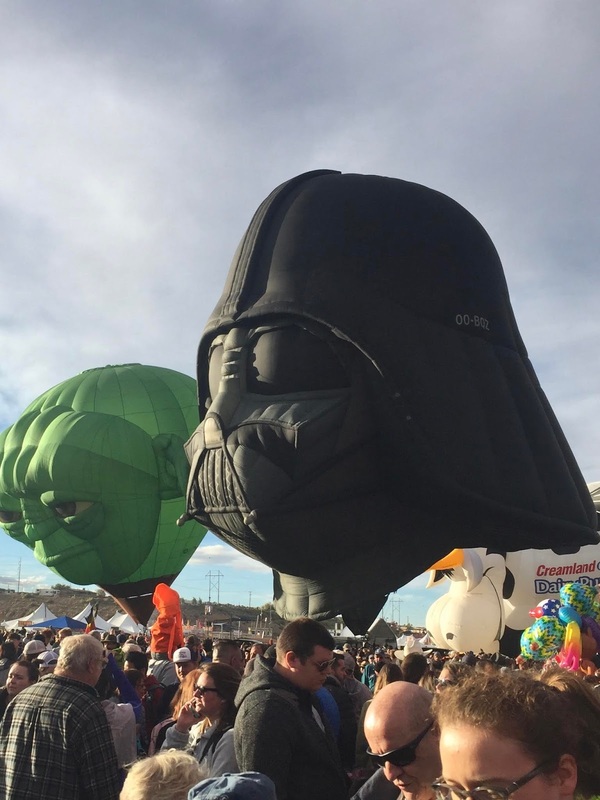 The Special shape balloons are creative and amazing. Sunset at the launch field. Night glow. 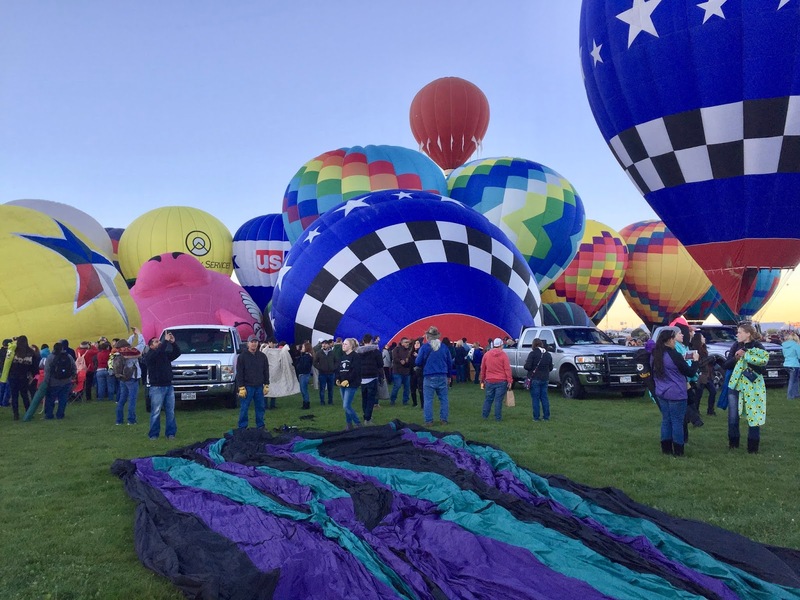 Balloons inflate for static display. 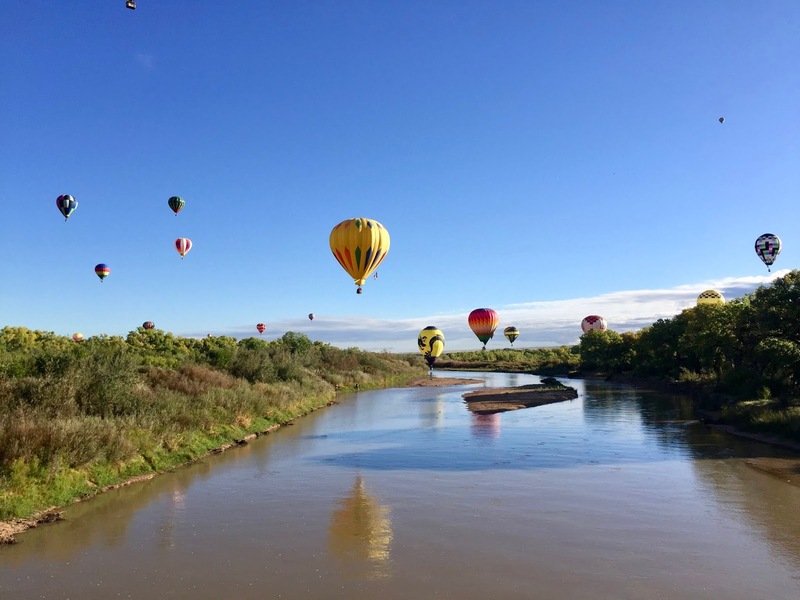 Mass Ascension, balloons launch in 2 waves. It's well organized, there are trained launch directors on the field, each responsible for a group of balloons. They're dressed like referees and referred to as Zebras, some of the ladies are very creative with their outfits. Christ the Redeemer from South America. My favorite balloon. Very huge, was quite the sight in the air. More special shapes that got a lot of attention. One of our landing spots. I took this shot as we finished packing up. The white sheet on the field indicated it was an balloon friendly field to land in. Some of the locals mark their property to be seen from the air. Always fun riding back to the launch field, everything piled in the back of the truck, with a few of us piled on top or in the basket. Spectators, other crews and traffic directors all waving to each other, fly day is a festive day. During the festival it's permissible to have balloon crews riding in truck beds. It was a tiring week but oh so great. Thanks to a fellow camper, we took a drive to this quaint country chapel several miles down a gravel road in the middle of no where. Services are still held here, must be mostly ranchers because there are no towns for miles around. 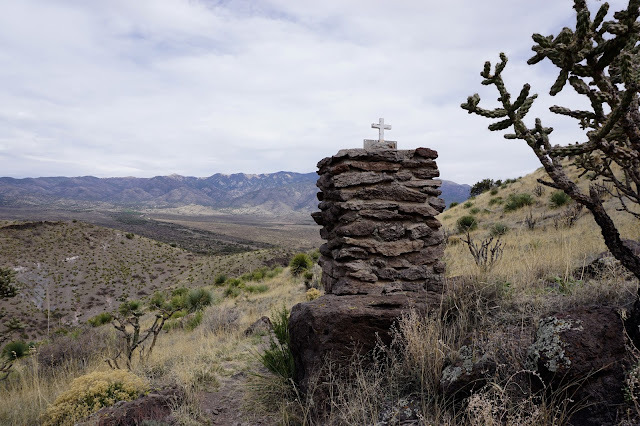 About a mile from the church are stations of the cross with a large cross perched on top a small mountain. The large cross can be seen for miles. We hiked up to several stations. Beautiful and serene. Looking at the map and our route to White Sands we saw the White River Petroglyph Site, decided to stop and check it out. Several miles off the highway, we were surprised to find out they had camping sites, one was available. 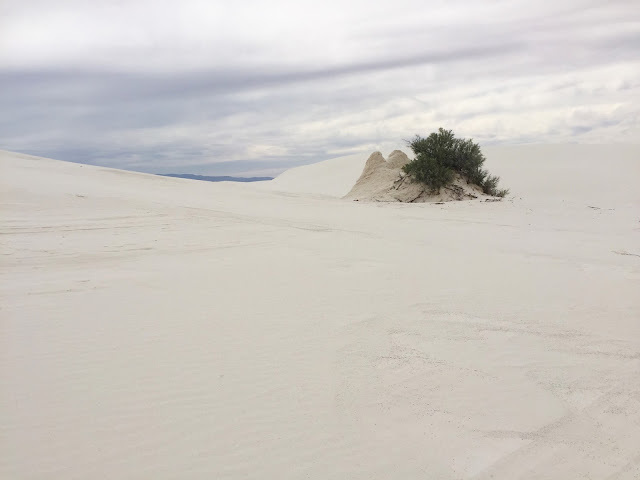 Our plan was to stay closer to White Sands but this little spot was just too good to pass up. 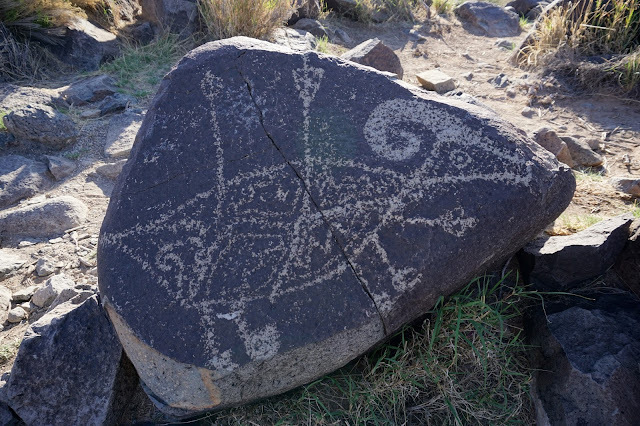 The small camping area was very peaceful, beautiful views and easy hiking to the petroglyphs. Our camping site was very spacious, we loved it so much that we ended up extending our stay. We’ve seen petroglyphs in the past but not like this. The vast numbers, interesting art and accessibility all incredible. 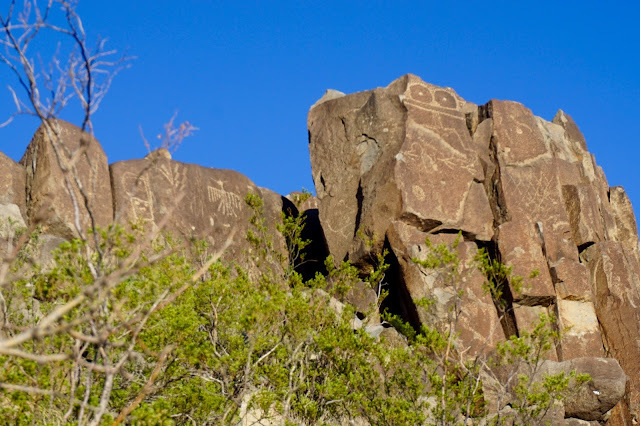 We hiked that ridge several times and found new petroglyphs every time. The rocky ridges rising above the Three Rivers Valley contain over 21,000 petroglyphs, including masks, sunburst, wildlife, handprints and geometric designs. 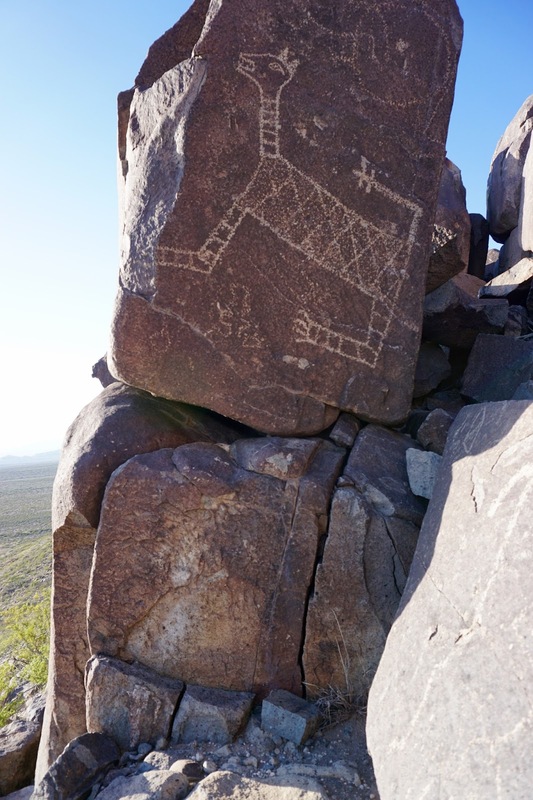 These petroglyphs were made by a group of Native Americans that archeologists determined to have lived here 1,000 years ago. The rock art seems to reflect a strong supernatural and religious connection to their environment. Above appears to be a big horn sheep pierced with arrows. Maybe communicating hunting grounds. High up on a boulder was one of my favorites. I like the eyes up on the boulder top, they're overlooking the valley below. but what they mean is up for much debate. Another of my favorites. This figure was drawn with ear rings. 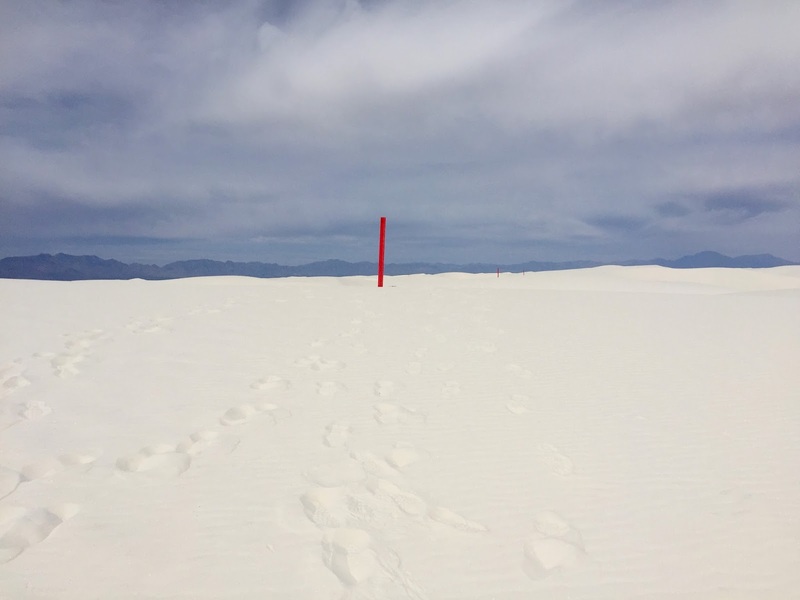 The world’s first nuclear bomb was assembled and tested here at the Trinity site on the White Sands Missile Range. The bomb was assembled at the McDonald ranch house about 2 miles from where it was detonated on July 16, 1945. The McDonald Ranch house was taken over by the Army as part of their training grounds. The McDonalds were paid a minimal amount and vacated the ranch under protest, they hoped the ranch would be returned to them after the war (which did not happen). The Army opens the Trinity Site to the public two days a year, once in spring and once in fall. We were camping a couple hours away but decided a unique opportunity to visit, we were on the road at 5:30am as we heard cars line up for miles to get through the security gate. The gates close at 2:00 sharp, if you’re still in line and waiting to get through, too bad. 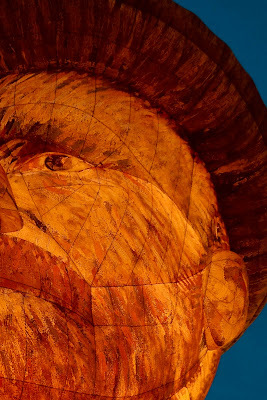 Not your typical tourist attraction, but very interesting and historic. There were informational signs posted on fences and volunteer guides to answer questions. The cone shaped monument is ground zero where the bomb was detonated. Interesting side note…On our drive to Trinity we saw a very out-of-place looking animal, we later learned it was an Oryx. The Oryx is an African gazelle, quite large, black and white in color with long straight horns. We later learned the Oryx was released in the white sands area back in the late 60’s as an idea to attract big game hunters. The Oryx has since multiplied to the point where numbers are considered problematic by ranchers. They have no natural predators in the White Sands area. Ending the day with a sunset from the top of the petroglyph ridge. April 4, after spending much of the winter in AZ, it’s good to be on the road again. 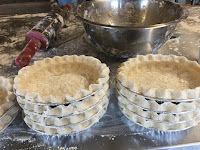 Heading east on NM Hwy 60 we found Pie Town, curiosity got the best of us and we do love pie…we just had to stop. Pie Town has a population of 60, we saw 3 little diners, all highlighting their pies. That’s about all there is to Pie Town, didn’t see any stores or gas stations. When we first walked into the Gathering Place diner we thought we entered through the wrong door, we were in the midst of ladies covered in flour rolling pie crusts and assembling pies. The ladies were joyfully welcoming and assured us we were in the right place. We bought a small white chocolate cherry pie for the road, however once we got out to the RV (Shorty) we just had to sample it. The pie was the most delicious cherry pie we've ever tasted, so good we went back in and bought a butterscotch blueberry. This is going to require some hiking. 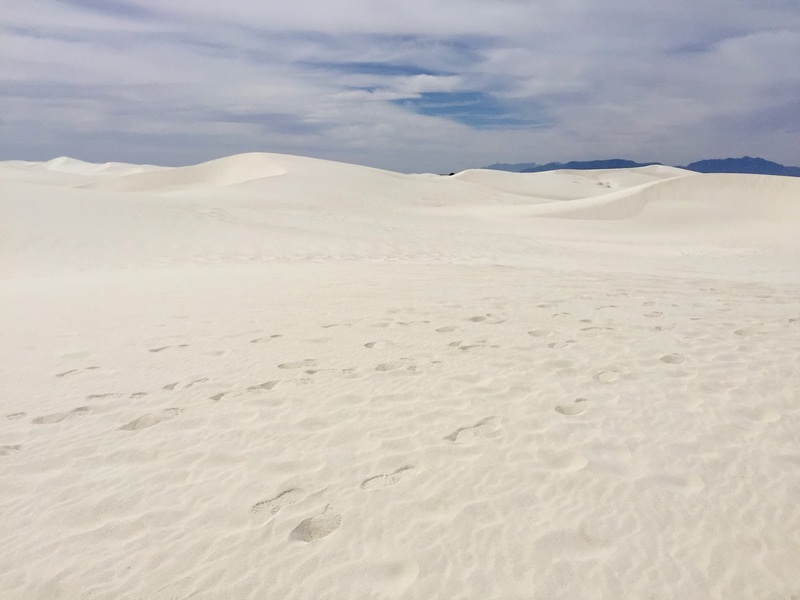 White Sands....best kind of "snow", looks like snow, glistens in the sun like snow, and is plowed with a road grader like snow. Kids bring their flying saucers and slide down the dunes. BEST PART, it's warm, no boots, mittens or long johns needed. 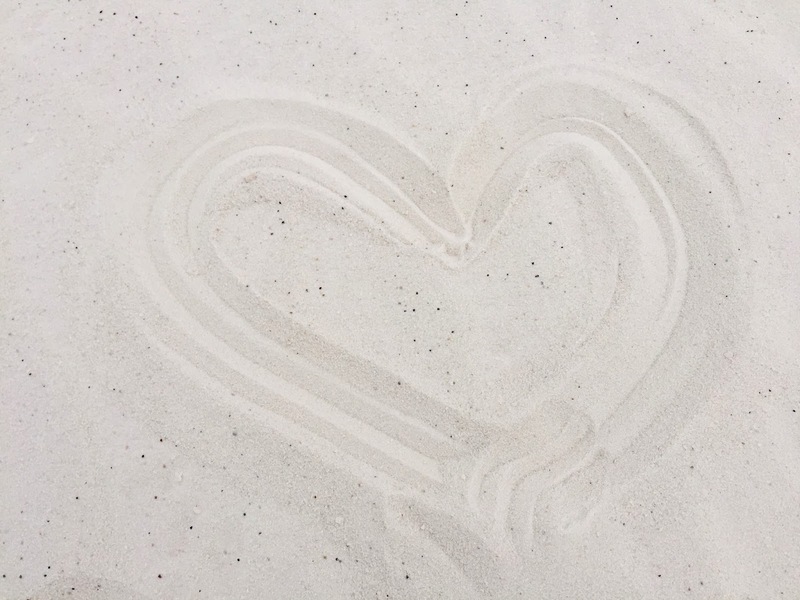 We welcomed the partly cloudy skies, the sun reflecting off the white sand is very bright. Little vegetation survives on the wind blown dunes. The sand has blown around this lone clump of bushes making for an interesting scene. 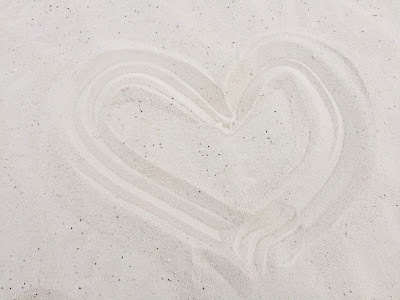 The sand is irresistible to scoop up and let it run through your fingers, it feels like a mix of sugar and flour. 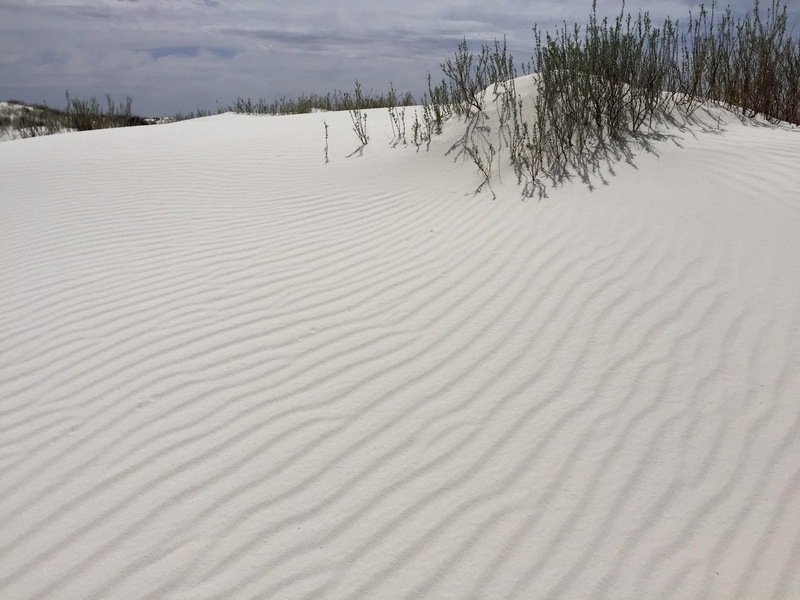 According to the park brochure, it's actually not sand but gypsum, the water table is shallow which keeps the dunes cooler compared to sand dunes in other parts of the country. One can go barefoot hiking in these dunes. 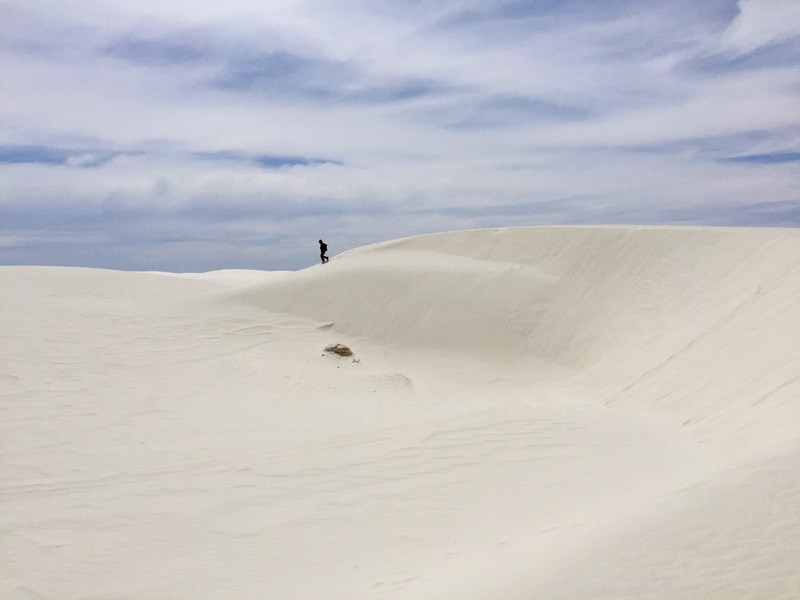 So much white, climbing each dune only left us with more ahead. The red stakes mark a trail. 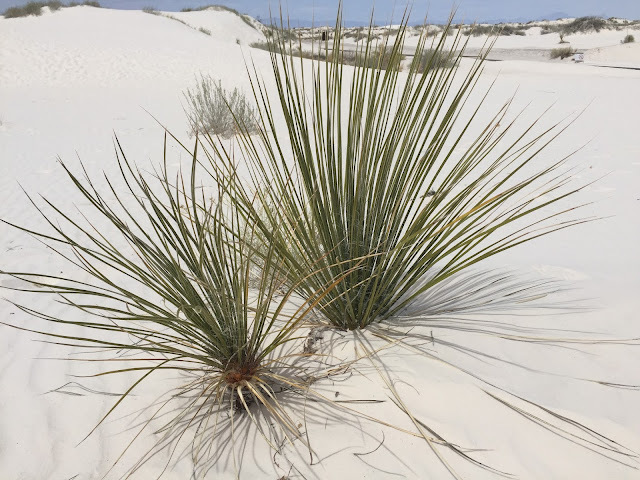 There are miles of dunes, up and down hiking. After the first dune we lost sight of the parking lot, it would be easy to get turned around. The outskirts of the dunes are more suitable for vegetation growth.